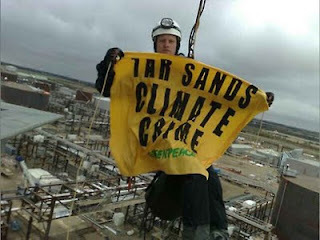 A few weeks ago, an international group of Greenpeace protesters blocked several of the conveyor belts at the Tar Sands. Thanks to social media and the internet, they were able to broadcast their protest as it was happening. Like any good protest, there were two kinds of public reactions. Some people were upset that protesters were disrupting the Tar Sands workers, preventing them from earning their money. Get the protesters out of the way. Others thought environmentalists need to ramp up their activity to communicate with a provincial Government that won't listen to them. Nobody should be doing this work. Both reactions are reasonable, and depend on the perspective of the person making the observation. Neither side is right. Trying to pick the economy instead of the environment is not a choice. You can have the environment without the economy, but you can't have the economy without the environment. They go together. Protesting, however isn't likely to change anyone's opinion. Let's get to the bottom of this. Countries that take care of their environment do better economically because of the ecological services that intact ecosystems provide. Countries that heavily exploit their environment do economically poorly, because they lose the ecosystem services. You get a striking image of this at the border between Haiti and the Dominican Republic. You may have seen the image in Al Gore's An Inconvenient Truth. The Dominican Republic side had a forest of trees. The Haitian side didn't. 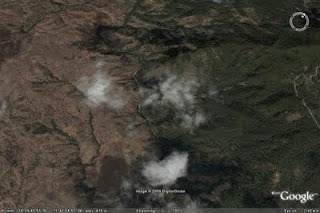 Haiti exploited their trees, and without them their economy collapsed. The Dominican Republic still had their trees, and were doing much better, economically, than Haiti because of it. In order to keep their trees from being illegally cut they transferred control of protecting the trees from the ministry of agriculture, who couldn't protect the trees, to the military, who did. They had to be that serious about protecting their natural capital and its ecosystem services, but it paid off for their economy. Environmental impacts aside, the tar sands promise a continued supply of fossil energy, but it distracts us from the real work of getting on with building a sustainable economy. One that has a chance to last. The tar-sands won't be stopped by protestors, but by economic and environmental reasoning once we realize that we're actually better off without them.